Together we can protect the future of grassroots football in Wales. Will you join us? We all know there's not enough quality pitches for the number of teams playing in Wales. And with the numbers playing the game at the highest ever levels, the pressure on our pitches is getting bigger. Our plan is to work at a very local level where we can tackle very local facility issues. Meanwhile, you will find resources here to help you. We are passionate about working with partners and our clubs in finding solutions to the problem. So you'll find below case studies of clubs who have gone through the asset transfer process or have developed 3G pitches for their clubs and communities. One of Wales' most iconic stadiums was months away from being closed-down for good. In 2015, Jenner Park had become unsustainable for the Vale of Glamorgan to maintain and proud club Barry Town United were on the brink of starting the search for a new ground. But part of the ambitious club's vision to return to its former glory was a FIFA pro accredited artificial 3G surface that would help them become a real community club. First team manager Gavin Chesterfield said: "Now it's about much more than the male section. We have a thriving women and girls section, a pan-disability section, a club based system from U5 to U16 and an academy that goes from U10 to a development team. "Having those sorts of numbers, it is doable with a grass surface. But to give them a stadium that they can all train and play on, isn't possible. This is another excellent example of how collaboration with the Welsh Rugby Union, Hockey Wales and Sport Wales is delivering more artificial turf pitches. Wales’ first indoor 3G football pitch was built at the University of South Wales. The massive investment by the our exclusive higher education partner includes two new floodlit outdoor 3G pitches, for use by the university and its community. 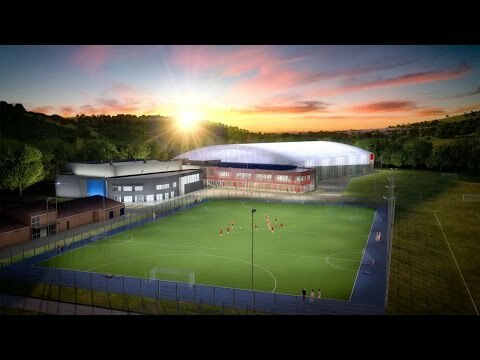 This exciting project helps us on the way to our ambitious target of 100 artificial pitches in Wales by 2024. The new facility, was built by Kier Construction and designed by Atkins. The thriving club, which boasts more than 500 players in its 33 boys’ and girls’ teams, were desperate to upgrade the facilities at the Swansea Council owned park and wanted ownership of it, in order to safeguard their club’s future. Chairman Chris Parkin said: “It’s been a long process but we’ve learned we need the support of the community and to have a very strict business plan with strong leaders. Mr Parkin MBE added: “Planning has been a big issue but we’ve taken on people who have experience in these things. “At the beginning, we thought we could do it ourselves but we soon realised that you need professional people to help with business cases, make planning applications and apply for charitable status. These things don’t happen that easily.